In Australia’s remote northeast Arnhem Land, Christmas is celebrated as a time to remember the dead, a time to evoke ancestral spirits (birrimbirr) and a time to renew and revitalize relationships amongst the living. Under the guidance of Yolngu director, Paul Gurrumuruwuy, Christmas Birrimbirr experiments with re-producing Yolngu Christmas rites in a gallery or museum setting. Drawing on Yolngu aesthetics and social values, the work uses new media technologies to strengthen contemporary Yolngu society while “sharing feelings” across cultures. The result is a unique media-art project structured by the performative power of Yolngu ceremony, charged with the combined potency of the Ancestral, Jesus Christ and Santa Claus. As the exhibition demonstrates, Yolngu have a special genius for taking-up objects, ideas and practices from elsewhere and making them their own. But what makes this project particularly unusual is the fact that it has been made with the conviction that non-indigenous audiences have much to gain by experiencing a Yolngu-style Christmas. Christmas Birrimbirr’s central focus is a three-channel video work that opens with images of the seasonal wulma clouds (brooding formations that signal the coming of both Christmas and the wet season). Symbolically structured around the graves of three Dhalwangu clan leaders, the unfolding sounds and images enact a poetics of loss and renewal, mourning and joy. Building from the slow and melancholic labour of clearing and decorating family graves, through the candle-lit singing of Christmas eve and the food preparations of Christmas morning, the work climaxes in the performative and emotional energy of a specially conceived (via Gurrumuruwuy’s dream vision) Yolngu Christmas Day bungul (ceremony). 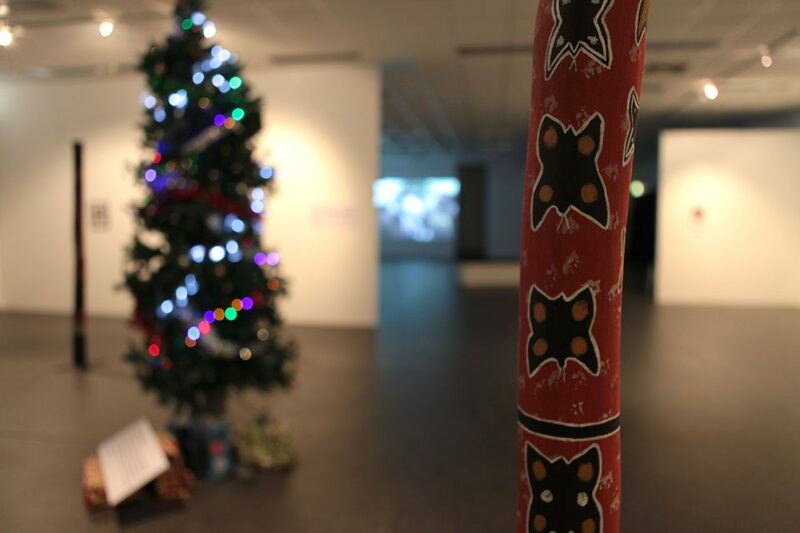 Alongside the video installation, a Yolngu Christmas Tree sculpture, surrounded by a forest of logs (especially painted by Gurumuruywuy and shipped in from Gapuwiyak), a series of photographs and smaller video works further claim and amplify the art gallery as a ceremony ground. The result is a powerfully moving glimpse into the pain, joy and resiliencies of contemporary Yolngu lives. At the same time it offers what its Yolngu directors call a “gift of grief”. It has been made for art gallery audiences precisely so that people living lives far removed from Gapuwiyak might have their own relationships, families and culture enriched by the resonant, sometimes difficult, images and feelings on offer. Christmas Birrimbirr premiered at the Chan Contemporary Art Space on 7th December 2011. The exhibition was launched with a ceremonial performance (bungul) and was officially opened by Northern Territory Chief Magistrate Hilary Hannam. 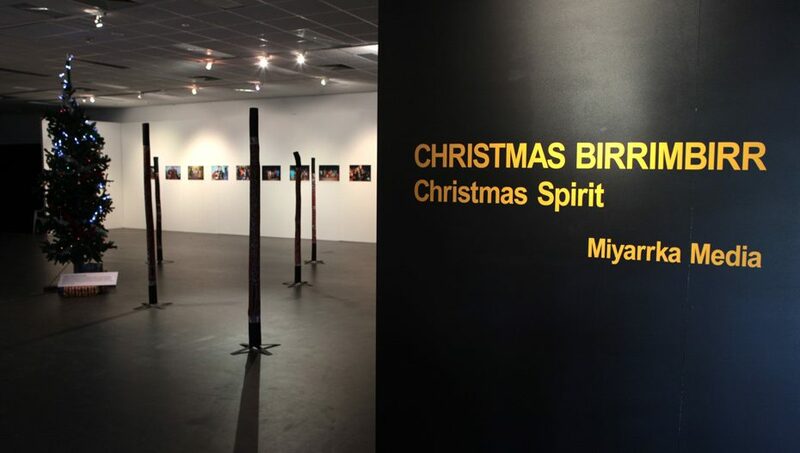 The launch had a special, deepened resonance for all involved as it marked the first Christmas since the tragic death of Birrimbirr’s co-director Fiona Y. Wanambi early in 2011. Miyarrka Media dedicates their work to her. images and voices of deceased persons.